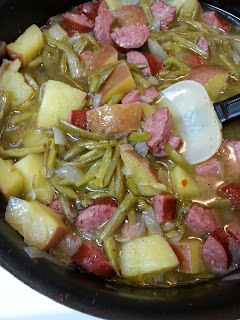 Sometimes simple is the best, like this recipe Sausage, Potatoes and French Green Beans. Heat oil in deep skillet over medium heat, add onions, salt, crushed red pepper, bay leaf, garlic powder and smoked sausage, stirring, cook until onions are soft. Add potatoes and sprinkle salt. Add chicken broth, bring to boil, reduce heat, simmer 10 minutes, until tender. Stir in french green beans, sprinkle with black pepper, cook another 5 minutes.